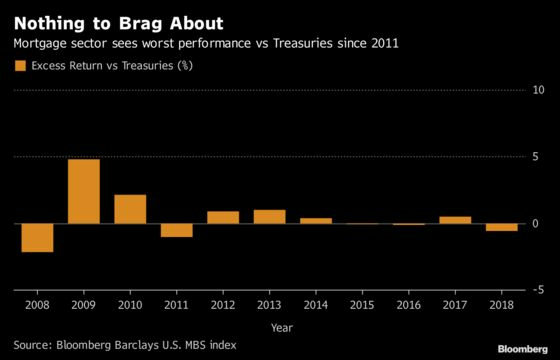 (Bloomberg) -- Mortgages had a rough 2018, seeing their worst performance versus Treasuries since 2011 and worst percentage return since 2013. 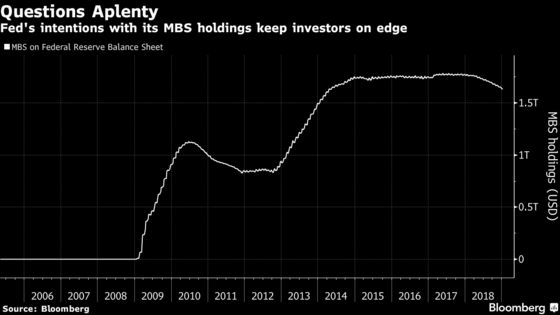 Now the minutes from the Federal Reserve’s December meeting have raised new questions over the central bank’s intentions regarding its $1.6 trillion agency MBS holdings. Those 38 words were the first time the central bank minutes has discussed the possibility of switching to active MBS sales since March 2017. At this moment the central bank is taking a hands-off approach to its MBS holdings, allowing the pace of its roll-off to be determined by prevailing interest rates. The FTN Financial MBS strategist team led by Walt Schmidt wrote in their 2019 outlook in December that this may add $200 billion of MBS supply for private investors to absorb this year. Mortgage spreads widened about 7 basis points over swaps last year partly in anticipation of this additional supply, yet should the central bank give that roll-off a helping hand once it considers its balance sheet "normalized" it is likely spreads would need to widen out further. If that comes to pass, the burden would fall most heavily on 30-year conventional and Ginnie Mae II 3 and 3.5 percents, according to the Barclays MBS strategist team. On the flip side, there is a possibility that should things go south in the housing and/or mortgage sector this year the Fed could decide to start buying again. That unknown was heightened of late by Fed Chair Powell’s Jan. 4 comment that the bank is "prepared to adjust policy quickly and flexibly and to use all of our tools to support the economy should that be appropriate to keep the expansion on track." The New York Fed has conducted small scale MBS purchases "for the purpose of maintaining operational readiness" for any future policy directives. Eric Schuppenhauer, president of Home Mortgage for Citizens Bank in Providence, Rhode Island, said in a phone interview with Bloomberg News last week the biggest unknown is not so much private demand "but whether or not the Federal Reserve will intervene again should it feel there are dislocations in the mortgage sector." This is of utmost importance for would be home buyers, as the overall performance of the mortgage sector will do much to determine the interest rates they must pay in order to borrow for a home purchase. Rising mortgage rates have pushed home affordability to near its lowest level since 2008, according to data compiled by Bloomberg News. So the Fed as marginal buyer, or seller, can be the proverbial bull in the china shop for housing. Another potential bull is the millennial generation and if they are willing or able to provide demand for the housing stock. This is of paramount importance, Kevin Jackson, a managing director on Wells Fargo’s mortgage trading desk, said in a telephone interview. "Student loans and credit card debt are weighing on the younger generation. Is the millennial generation going to be that marginal buyer? I don’t believe so, and housing could experience trouble over the next few years because of that."